If you are looking for a quality hotel accommodation in Carrick on Shannon, Cryans Hotel is the perfect choice! 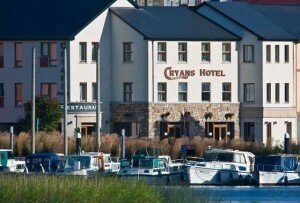 Cryans Hotel is located right beside the River Shannon and Carrick on Shannon Town Centre. It has retained its old-world charm that’s seldom seen in modern Ireland. The hotel situated on the banks of the River Shannon which makes it the perfect getaway to relax and soak up on some genuine Irish hospitality. At the same time, you’re less than a minute away from all the hustle and bustle of all the local pubs, shops, and restaurants. Cryans Hotel boasts of 24 stylish rooms. All of their bedrooms are equipped with plasma screen TVs, tea & coffee making facilities, iron, and ironing board. Most rooms have riverside views and all the rooms have free internet access with Free Wi-Fi connection available throughout the hotel. They have easy-access rooms for the disabled guests. Facilities and services include: complimentary newspapers at reception, babysitting service, laundry service, and complimentary bottled water in bedrooms on request.